Did you know that voting matters to your mental health? Research has linked psychological benefits to voting; especially when you believe that your vote makes a difference. However, beyond the research, the persistence of social inequalities and health disparities continue to impact the mental wellness of many Black communities. 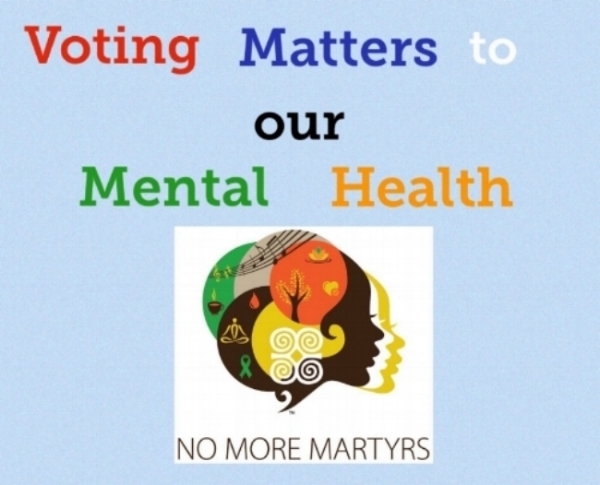 As a result, Voting Matters to Our Mental Health! No More Martyrs has collected a list of valuable resources. Tap into the list below to learn about the various ways you can make your vote count. The Black Voters Matter Fund seeks to increase the power of Black voters. Through their efforts, they offer voter registration and policy education to Black communities. The Black Women’s Health Imperative (BWHI) seeks to solve the most pressing health issues that affect Black women and girls in the U.S.In 2018, BWHI released its inaugural legislative agenda, Black Women Vote: The 2018 National Health Policy Agenda. This powerful resource builds upon Black women’s political influence. Woke Vote seeks to to invest in the activation, long-term engagement, training and development of new organizers, and mobilization of historically disengaged voters of color. Black Girls Vote seeks to inspire women of color to use the political process to improve the quality of life for their families and the collective community. The National Coalition on Black Civic Participation is dedicated to increasing civic engagement and voter participation in Black and underserved communities. The Congressional Black Caucus Foundation (CBCF) seeks to advance the global black community by developing leaders, informing policy, and educating the public.